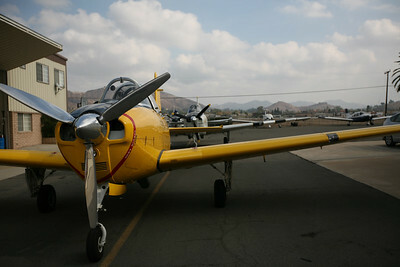 A collection of images of aircraft. 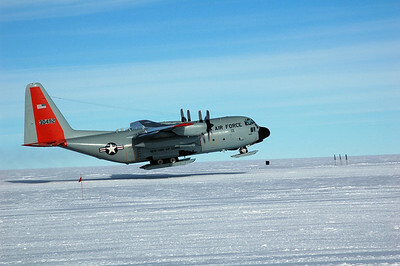 SOUTH POLE STATION, ANTARCTICA: Here comes the LC-130 Hercules in for landing. 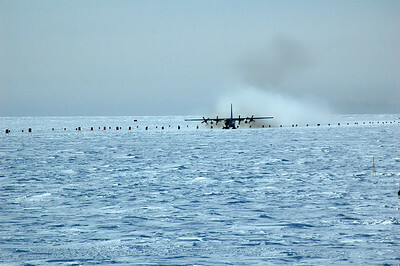 SOUTH POLE STATION, ANTARCTICA: As it touches down it kicks up the loose snow on the skiway. 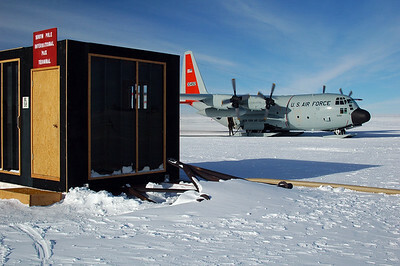 SOUTH POLE STATION, ANTARCTICA: The LC-130 taxis into position. 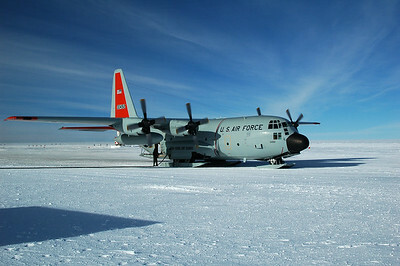 SOUTH POLE STATION, ANTARCTICA: The LC-130 Hercules gets plugged into the fuel system and offloads the fuel it can spare for the winter. 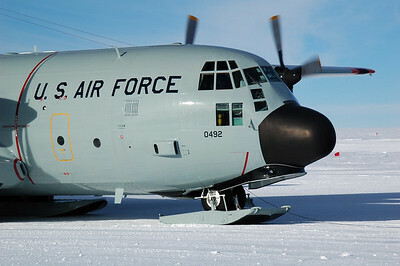 SOUTH POLE STATION, ANTARCTICA: The landing gear is equipped with skis to land on the snow runway. SOUTH POLE STATION, ANTARCTICA: The South Pole International Passenger Terminal. 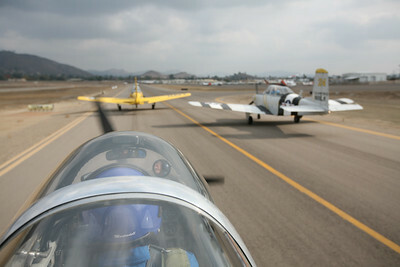 No passengers on this flight, it's pure cargo and fuel. 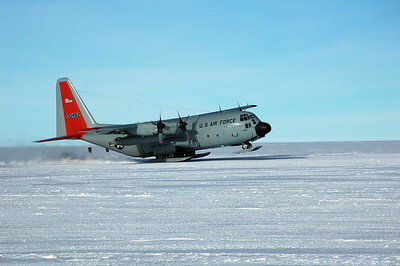 SOUTH POLE STATION, ANTARCTICA: The LC-130 Hercules gains speed and gets its nose off the ground. 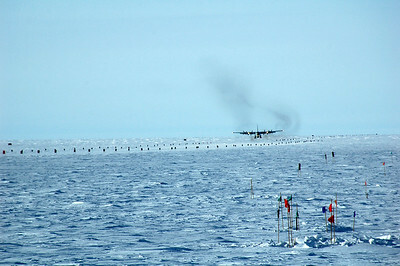 SOUTH POLE STATION, ANTARCTICA: The wings flex up and finally pull the rest of the aircraft off the snow and into the sky. 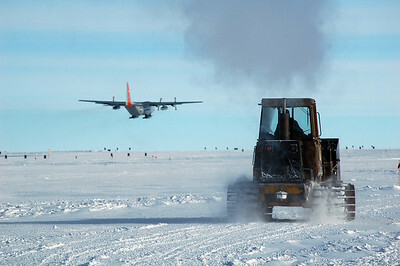 SOUTH POLE STATION, ANTARCTICA: A forklift drives by as the plane continues to rise and will circle back around to return to McMurdo Station on the Antarctic coast. SOUTH POLE STATION, ANTARCTICA: Our first tourists. 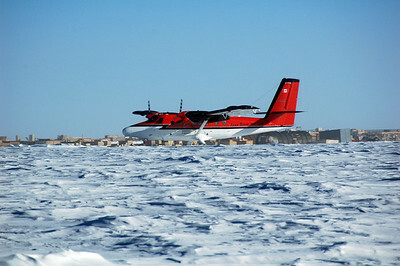 They come by Twin Otter. 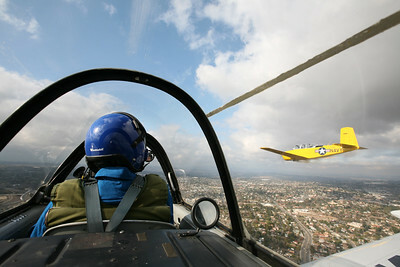 This group was Norwegian. 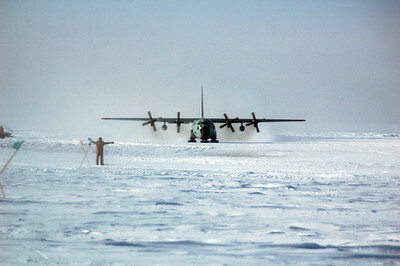 They first landed at 88 degrees south to drop off some folks who will ski the last two degrees to the pole. 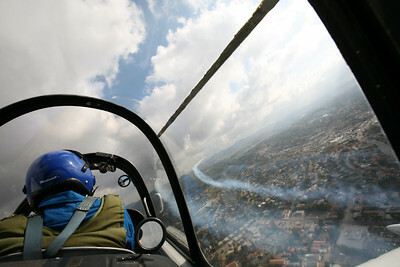 Then a few folks flew on to come visit the pole the "easy" way. 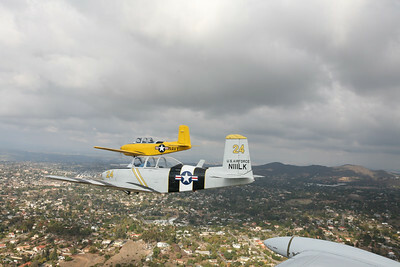 This visit may have cost them as much as $33,000! 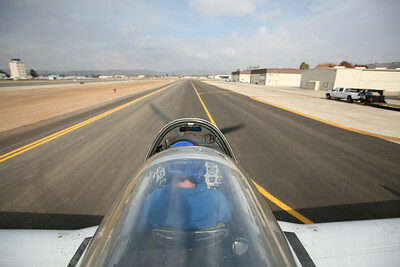 Leaving the South Pole. 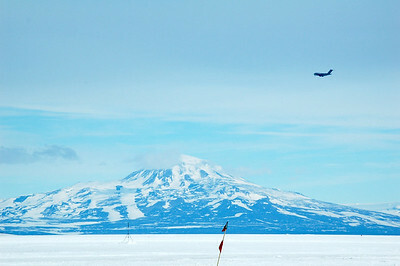 Getting to McMurdo and finally on to Christchurch, NZ. 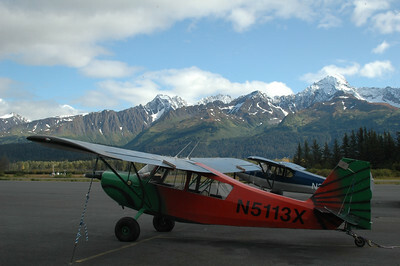 Planes at the Seward Airfield. 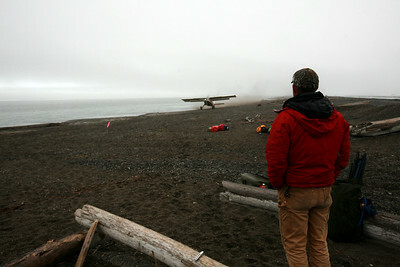 KONGAKUT RIVER, AK - Camp IX: Icy Reef; Bobby watches the Helio Courier as it roars along the beach we cleared to take off and haul Lindsay, Sune and a load of gear off Icy Reef. 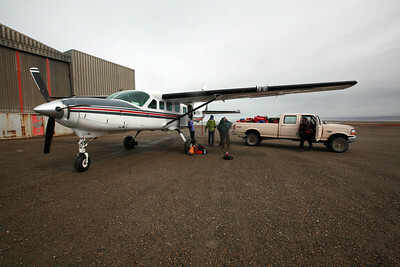 KAKTOVIK, AK - After packing up camp, spending the day at the Waldo Arms Hotel having breakfast, lunch and a shower we drive back out to the airstrip to load the Wright Air Service Cessna 208 Grand Carivan for our flight back to Fairbanks. Rafting the Kongakut River from the Brooks Range to the Arctic Ocean on the North Slope of Alaska. 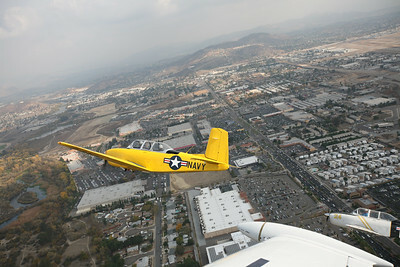 packrafts and inflateable kayaks. 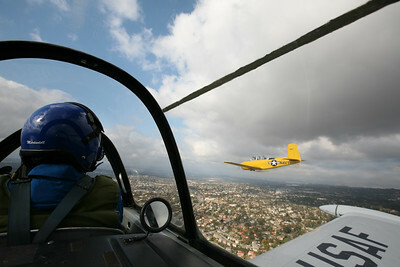 Class I and II rapids. 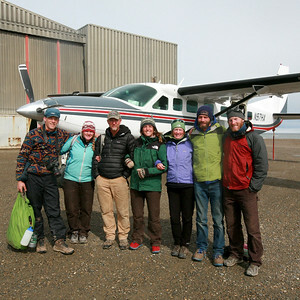 Expedition members: Bobby, Natalie & Jessie Lewis, Sune & Lindsay Tamm, Nathaniel Wilder, and Cameron Martindell. 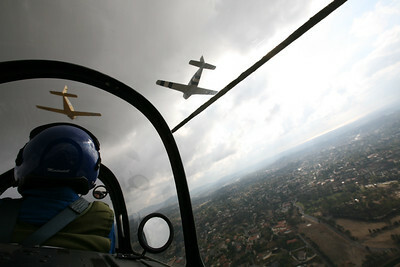 22 June - 6 July 2010.